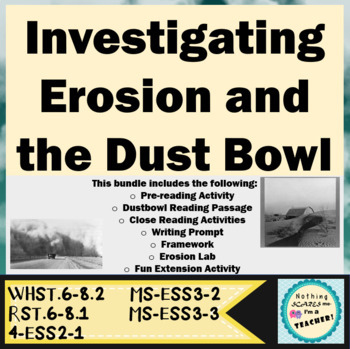 This lesson includes an LDC common core lesson on erosion that focuses on the Dust Bowl. Includes a pre-reading activity, article (written on a 6.5 grade level), reading guide, close reading activity, writing prompt and framework, erosion lab and extension activity (erosion sign). Everything is ready to print and use. Materials required for the lab are: goggles, shoebox, sand and straw. If you like this activity, try these!